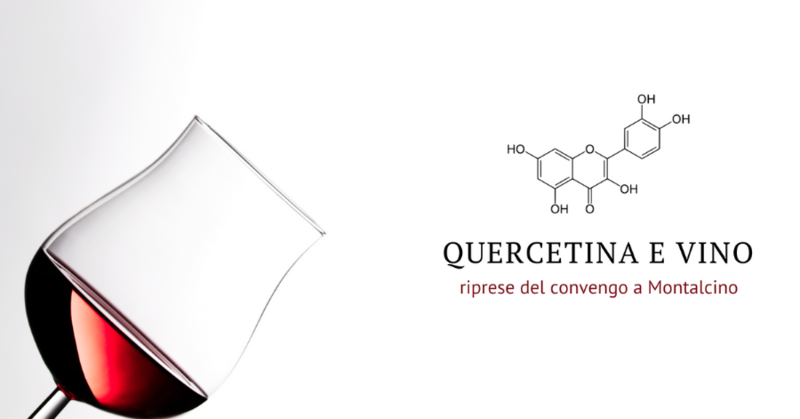 The formation of quercetin sediments in Tuscan Sangiovese wines is the subject of QUESTAB, a two-year innovation project co-funded by the Tuscany Region as part of the sub-measure 16.2 of the 2014-2020 PSR, which sees the company leader Col d'Orcia di Montalcino. The experimental activity, conducted mainly by ISVEA service company of Poggibonsi, was carried out with the support of the Consorzio dei Vini di Montalcino, the scientific advice of proff. Michel Moutounet (ENSAM Montpellier) and Annalisa Romani (Univ. Florence) and the assistance of the company VINIDEA. With the approach of the end of the project, scheduled for September 2018, we wanted to present to the technicians of Tuscany a summary of the results obtained, on the occasion of a conference held in Montalcino on 15th of June 2018 entitled "Quercetina & Vino". The conference, which had Gianni Trioli (Vinidea) as moderator, opened with the greetings from: the Councilor to the Municipality of Montalcino Donini Cristian, Gemmiti Alessandra (Tuscany Region), of the Count Francesco Marone Cinzano (owner of Col d'Orcia), of the President Cencioni (Consorzio dei Vini di Montalcino) and finally of Dr. Gianfrancesco Baldetti (Director of ISVEA), who explained the principles and the motivations behind the project and expressed appreciation for the work done by the group. Antonino Tranchida, technical director of Col d'Orcia, has exhibited the decades-long path taken by the company to manage the problem of Quercetin, which had as its last stop the QUESTAB project in which the well-known company of Sant'Angelo led further important experiments. Annalisa Romani, of the University of Florence, has summarized the importance of quercetin in determining the antioxidant power of wines obtained from Sangiovese, and has exposed some original results on the dynamics and conditions of formation of flavonols in grapes. Michel Moutounet, former director of the UMR Science for the Oenology of INRA-ENSAM in Montpellier, resumed work after the coffee break talking about the crucial role of temperature in determining the evolution of wine over time and the chemical-physical phenomena of its components, including quercetin. Francesca Borghini from ISVEA presented the various stages of the experimental work carried out in the project, which saw trials of vinification of grapes with different origins and constitution, tests for the conservation of wines under different conditions and treatment with additives and adjuvants of various kinds, as well as accurate chemical and sensory analytical checks. Stefano Ferrari of ISVEA concluded the day by tracing the applicative conclusions of the work carried out, clarifying in what conditions more quercetin is produced in the vineyard, the dynamics of transition from glycosidate to unstable aglycone, the effectiveness of some stabilizing treatments and the current possibilities of eliminating excess unstable quercetin. All the videos are in italian.